What a cutie, money well spent on this Luxury red cat collar with safety elastic and beautiful be..
What a beauty, money well spent on this Luxury Buttercup cat collar with safety elastic and beaut..
RECUCED FROM £11.99. 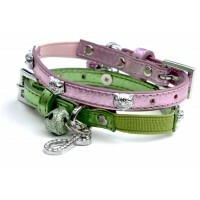 These fabulous NEW collars are to meowwww for!! 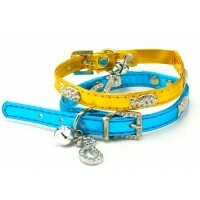 Just arrived, don'..
Wow how can you resist, this Metallic Blue or Gold fish collar will be the envy of all of your fe.. These wonderfully glamorous leather collars have a diamante encrused buckle with diamante studdin..
Wow, this cat collar really sparkles! Add a bit of glam to your kitty. This collar has a safety e..
A must have for your precious felines out there, any self respecting cat needs to wear our Puchi .. 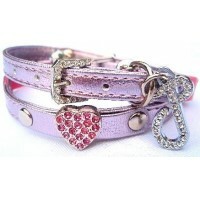 This must be one of the slickest cat collars in town your cat will look super cool in this design..